Compared to what? That’s the question I kept asking myself as I explored Dubai for the second time. Like many people I have serious concerns about the glistening new city-state. But in the end I’ve decided that it’s all really a matter of degree, not kind. I came to this conclusion unexpectedly and begrudgingly. I wanted to hate the place much more than I ultimately did. For all its behind-the-scenes repression and social injustice Dubai is thriving primarily because so many other places are failing so spectacularly. It’s a carnival mirror held up to the rest of the world reflecting the things we don’t like to acknowledge in our own backyards. How is an indoor ski resort in the Persian Gulf all that different from ice hockey stadiums in Houston, Miami, or Los Angeles? How is the Edmonton Mall in the frozen plains of Alberta really different from the Dubai Mall out in the desert? How is a city of over two million people kept alive in a forbidding landscape with no water or farm land? Ever been to Henderson, Nevada or Scottsdale, Arizona? Isn’t it cruel and immoral to use underpaid and exploited immigrant workers who are systematically threatened with deportation? Really? Really? Do I need to go there? Dubai is the love child of Singapore and Las Vegas. I choose these two “parents” very carefully. The founder of modern Singapore, Lee Kuan Yew, was fond of saying that what impoverished countries lacked most is good governance. Singapore was transformed from a tiny hardscrabble island nation with no hinterland or natural resources to a world class economy in a matter of forty or fifty years. Skilled management was responsible for most of that success. Singapore’s puritanical one party rule can be criticized on many levels, but providing a safe prosperous life for its people is not on that list. And its inhabitants are free to leave if they feel oppressed – which some do. Las Vegas cultivated an economy based on strategically pulling in money from outside the region. Tourism, tax havens, property investment, and retirement villas turned a one horse town in a desert wasteland into a massive growth machine. Is Vegas built to last? Probably not. But it has demonstrated some basic principles that, for the time being, are highly effective. Dubai has far less oil than its neighbors. The emires (Arabic kings) understood that once their modest supplies were pumped dry there would be nothing to fall back on. Their nation would sink into poverty and chaos. You don’t have to look very far in the region to see what happened to other nations whose leaders weren’t so thoughtful or wise. Nearby Yemen is the poster child for depletion, population overshoot, and collapse into bloodshed. Dubai provides stability and order in a world where that’s often hard to find,so long as you can afford it. Pakistan, Sudan, and many other places are simply incapable of getting their sh*# together. In a troubled world middle and upper class people are looking for a safe haven to stash their money and their families. 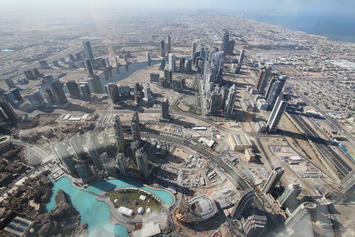 Dubai skims the cream off the turbulent bits of the planet. It’s a pure pay-per-view environment and the ultimate gated community. I honestly can’t blame people for choosing to relocate to Dubai when the alternative back home in Syria or Zimbabwe is what it is. This is especially true when so many other destinations aren’t so welcoming. At the same time armies of desperate workers from failed states are invited in to do the dirty heavy lifting on the cheap. Bangladesh, Pakistan, Ukraine, Burma, Nigeria, Bosnia… Depending on their skill set there’s a special niche for each type. Illiterate Malaysian men have one kind of use in construction. Pretty young women from the Philippines and Bulgaria are put to use as cleaners and nannies (among other things.) These workers are “guests” who are cycled through every couple of years thereby eliminating the need for pensions, schools, proper housing, health care, and other long term social obligations. This is the purest expression of neoconservative Reagan/Thatcherism. For better. And worse. But these workers wouldn’t be in Dubai at all if their home countries provided them with proper education and employment. I can’t say I love Dubai or that I would ever want live there myself. But I understand it more now that I’ve poked around in person a couple times. I simply can’t criticize it in isolation without acknowledging how much Dubai is merely taking global trends to their logical extensions. From that perspective it’s a great mirror to examine conditions everywhere rather than indulge in obsessing about Dubai’s particular shortcomings. If you don’t like the place and what it stands for you might want to re-examine your own country first. They may be more similar than you think.